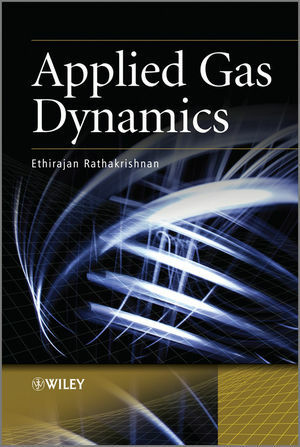 In Applied Gas Dynamics, Professor Ethirajan Rathakrishnan introduces the high-tech science of gas dynamics, from a definition of the subject to the three essential processes of this science, namely, the isentropic process, shock and expansion process, and Fanno and Rayleigh flows. The material is presented in such a manner that beginners can follow the subject comfortably. Rathakrishnan also covers the theoretical and application aspects of high-speed flows in which enthalpy change becomes significant. Applied Gas Dynamics is aimed at graduate students and advanced undergraduates in Aerospace Engineering and Mechanical Engineering who are taking courses such as Gas Dynamics, Compressible Flows, High-Speed Aerodynamics, Applied Gas Dynamics, Experimental Aerodynamics and High-Enthalpy Flows. Practicing engineers and researchers working with high speed flows will also find this book helpful. Ethirajan Rathakrishnan is a Professor of Aerospace Engineering at the Indian Institute of Technology, Kanpur, where he is in charge of the high speed aerodynamics laboratory. Rathakrishnan's research interests are experimental and theoretical gas dynamics and rarefied flows, as well as applied gas dynamics in high speed jets, sudden expansion problems, aeroacoustics, and active and passive control of jets and base flows. He has led numerous research projects with the Indian Space Research Organization (ISRO), Defense Research and Development Organisation (DRDO), National Aerospace Laboratory (NAL), Hindustan Aeronautics Limited (HAL) and IIT Kanpur. He has been a visiting professor at Clarkson University, Florida State University, Hyperschall Technologie Gottingen, the International Centre for Theoretical Physics, Trieste, Italy, and the University of Tokyo. Honors include the Excellence in Aerospace Education Award from the President of India and Best Teacher Award by the Uttar Pradesh Chapter of Publishers. Rathakrishnan is also an active conference organizer and keynote speaker. He holds a BSc in Mathematics from Madras University, DMIT in Aerodynamics, Propulsion, and Aircraft Structures from MIT Madras, an M Tech in Aerodynamics from IIT Madras, and a PhD in Gas Dynamics: Rarefied and Continuum Regimes from IIT Madras. 1.1 Definition of Gas Dynamics. 1.4 Supersonic Flow – What is it? 1.8 Thermodynamics of Fluid Flow. 1.9 First Law of Thermodynamics (Energy Equation). 1.10 The Second Law of Thermodynamics (Entropy Equation). 1.11 Thermal and Calorical Properties. 1.15 Subsonic and Supersonic Flows. 2.3 Discharge from a Reservoir. 2.7 Performance of Actual Nozzles. 2.9 Dynamic Head Measurement in Compressible Flow. 3.2 Equations of Motion for a Normal Shock Wave. 3.3 The Normal Shock Relations for a Perfect Gas. 3.4 Change of Stagnation or Total Pressure Across a Shock. 3.6 The Propagating Shock Wave. 4 Oblique Shock and ExpansionWaves. 4.3 Relation between β and θ. 4.5 Supersonic Flow Over a Wedge. 4.8 Supersonic Expansion by Turning. 4.10 Simple and Nonsimple Regions. 4.11 Reflection and Intersection of Shocks and Expansion Waves. 4.15.1 Application of Thin Aerofoil Theory. 5.3 General Potential Equation for Three-Dimensional Flow. 5.4 Linearization of the Potential Equation. 5.5 Potential Equation for Bodies of Revolution. 6.2 Two-Dimensional Flow: The Prandtl-Glauert Rule for Subsonic Flow. 6.3 Prandtl–Glauert Rule for Supersonic Flow: Versions I and II. 6.4 The von Karman Rule for Transonic Flow. 6.6 Three-Dimensional Flow: Gothert’s Rule. 7.2 General Linear Solution for Supersonic Flow. 7.3 Flow Over a Wave-Shaped Wall. 8 Flow with Friction and Heat Transfer. 8.2 Flow in Constant Area Duct with Friction. 8.4 Flow with Heating or Cooling in Ducts. 9.2 The Concepts of Characteristic. 9.4 The Numerical Computational Method. 9.5 Theorems for Two-Dimensional Flow. 9.6 Numerical Computation with Weak Finite Waves. 9.7 Design of Supersonic Nozzle. 10 Measurements in Compressible Flow. 10.12 Instrumentation and Calibration of Wind Tunnels. 10.13 Calibration and Use of Hypersonic Tunnels. 11.4 Aerothermodynamics of Engine Components. 11.6 Performance of Actual Intakes. 11.8 Oblique Shock Wave Incident on Flat Plate. 11.9 Normal Shocks in Ducts. 11.14 Limits of External Compression. 12.2 Mathematical Treatment of Jet Profiles. 12.3 Theory of Turbulent Jets. 12.4 Experimental Methods for Studying Jets and the Techniques Used for Analysis. 12.5 Expansion Levels of Jets. Applied Gas Dynamics Visit the companion website to access an Instructors Solution Manual and Lecturer's Slides.